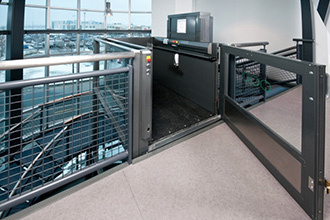 If your business or commercial building has multiple floors, you know the importance of having elevators and wheelchair lifts installed to make all areas of your space accessible to all and comply with the ADA. At Nationwide Lifts, we are proud to offer our customers the best when it comes to building lifts and elevators. We manufacture and sell an extensive collection of commercial wheelchair lifts perfect for a number of applications. Our vertical wheelchair lifts are ideal for commercial or residential settings and can lift a person up to 14 feet. Our stylish options include a glass vertical wheelchair lift, which has a sleek, modern design and is perfect for office buildings, hospitals, and more. 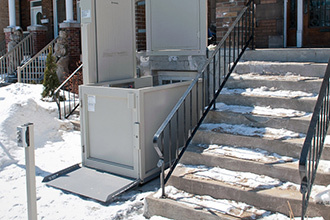 We also offer a vertical commercial wheelchair lift that can be installed outdoors. These make it easy for those who require the use of a wheelchair to safely enter your building without a problem. 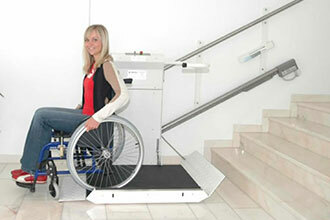 We also offer inclined wheelchair lifts that can carry a user up either a straight or curved flight of stairs. Nationwide Lifts is a trusted source for the most innovative commercial wheelchair lift designs, and we strive to carry the best products so that businesses can be safer and more accessible to all people. 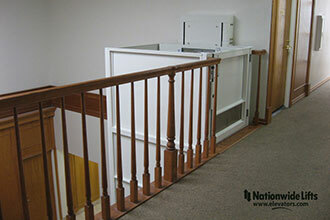 Shop Nationwide Lifts' selection of wheelchair lifts today to find one that is right for your space. Already got one but it's on the fritz? 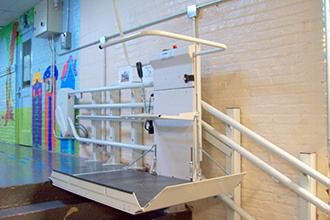 We are proud to maintain and repair wheelchair lifts for buildings as well. 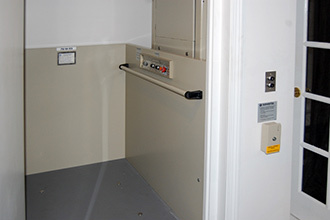 Give us a call today to learn more about how you can purchase a wheelchair lift for your building. We make it easy to buy online, but if you require some guidance as to which option is best for you, we would be happy to help. We'll also send you a free catalog and provide you with a quote before you make your decision. Call now or fill out our online request form to find out more about the commercial wheelchair lift options that we have for sale.